Effortless capture of Manufacturing Data at its source can bring many benefits to your business. Yield rates & deviations can be measured in real-time. Corrective action can be taken more rapidly thereby reducing wastage & reducing costs. Data entry can be validated at source to ensure accuracy, and predictive trend analysis can be conducted to predict future failures. For customers using Oracle’s E-Business Suite, Oracle Quality provides an enterprise wide repository which can store, analyze & audit all Quality data. The problem lies in an effective mechanism to enter large amounts of machine & operator generated data into the system, and to provide an effective review, approval & corrective action system for deviations. Behind the scenes, the solution is flexible enough to integrate with any ERP or database of choice and not just limited to Oracle E-Business Suite. 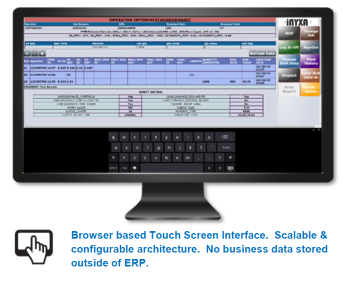 A touch-screen interface to efficiently capture and validate data from various sources and post it to Oracle Quality. Operator Data can be configured as Run-In & Run-Out where one Quality Entry is composed of two readings, or as RUN only, where one Quality Entry is composed of a single reading. Inspector interface supports four types of inspections for Startup, In Process, In-Process Final & Final. Ability to configure what elements are accepted at each stage of inspection. Ability to monitor Operator & Inspector data entry. Sample Size based or Discrepancy based approval. Ability to log time against jobs with a start / stop time entry.